Following Chris Huhne’s visit to Hinkley Point nuclear power station in West Somerset today, campaign group Kick Nuclear has slammed the Energy Secretary's glowing appraisal of the government’s consultation on the revised draft National Policy Statements on energy infrastructure and its plans for a new generation of nuclear power stations. 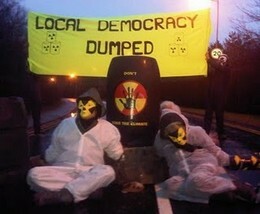 "It’s ironic that Huhne should be singing the praises of the nuclear industry at Hinkley Point just days after an independent report revealed that soil around the Somerset power station is heavily contaminated with cancer-causing enriched uranium. The government’s indifference to the dangers of nuclear power and its waste products is astonishing. "The consultation process completely failed to acknowledge that there is no scientifically proven way of storing nuclear waste over the long-term,’ Nancy continued. 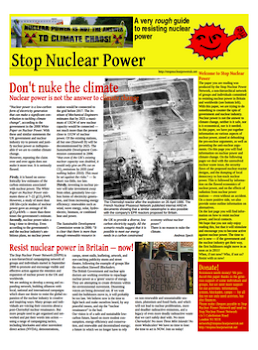 "Until this issue is resolved, it’s irresponsible to give the go-ahead to a new generation of nuclear power stations. It’s like telling people they can carry on smoking because sooner or later someone will find a cure for cancer." Kick Nuclear points out that nuclear power will offer too little, too late to help bridge the energy gap. Two EPR reactors being built in France and Finland are running years behind schedule and BILLIONS of pounds over budget. 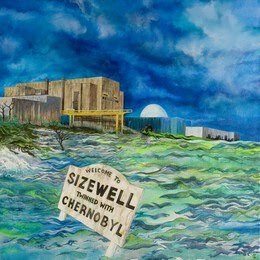 The EPR - designed by French company Areva, which EDF intends to build at Hinkley Point, at Sizewell in Suffolk and elsewhere - is untried and untested. Leaked EDF documents have also shown that there are serious safety flaws in the design. "A number of well respected NGOs and research groups have shown that it’s perfectly possible to combat climate change without nuclear energy," Nancy adds. "The nuclear sector is a dinosaur that is desperately clinging on to life. 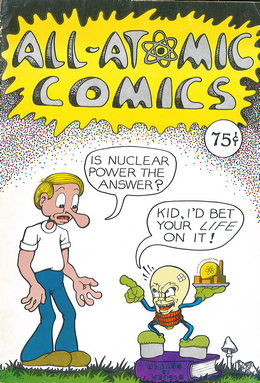 The mismanagement of nuclear waste over the last 60 years is shocking. Our air, water supplies and food chains have already been contaminated with radioactive waste. The sooner the nuclear monster is put down the better." Kick Nuclear points out that Chris Huhne’s assertion that the energy NPS consultation produced an "impressive level of public engagement" tells only half the story. "The truth is that most of the people attending the consultation events were either energy sector reps or people opposed to nuclear power," said Nancy. 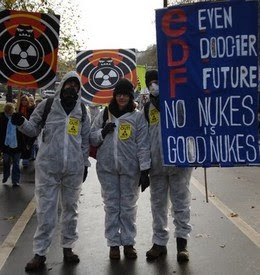 Green Audit’s report, 'Significant radioactive contamination at proposed site for nuclear power station,' is based on data provided in an environmental impact assessment commissioned by EDF Energy as part of the process towards building two new reactors next to the existing power stations at Hinkley Point.